Secluded, luxurious and fully self-contained, Coromandel Cottage is a highly desirable place to stay. a ROMANTIC HIDEAWAY FOR TWO! or adult timeout from youngsters. The main lounge with 180* Harbour views has large LCD TV, Freeview and DVD, a superb multispeaker Bose sound system with connector for your ipod. Dvds, CDs, FREE WIFI INTERNET. A library of books, magazines and games are also provided. This area is open plan, with fully equipped entertainer's kitchen, dining table, open fire surrounded by luxurious leather seating and extending out onto deck with large gas BBQ and outdoor furniture. The upper lounge with harbour views, includes a standard flatscreen TV Freeview , woodburning fire and intimate seating including a double sleeper sofa. This lounge leads to a small rear deck with views and access to the hillside garden and native bush. Total of three fires available with dry wood supplied, creates the perfect atmosphere. Full laundry facilities included. Two toilets, a new shower with heated flooring, and access to a private beach just a few minutes walk away describe just some of the great facilities at Coromandel Cottage. The Auckland Ferry Service to Coromandel Town is an easy solution to escape the big city. A new taxi service ensures your transport needs are met when driving is not an option. This residence is the private getaway for a Waikato Physician. Now available to guests wishing to experience true Coromandel living in style. This property offers year round comfort and enjoyment. 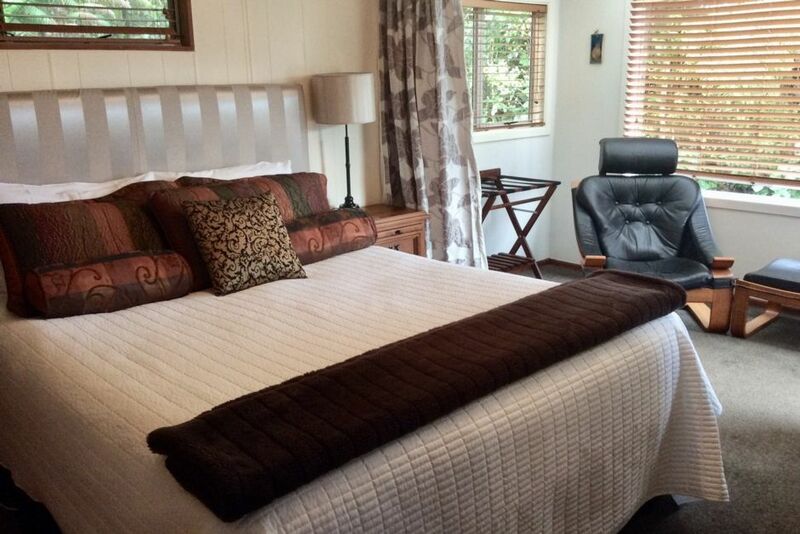 Minimum 2 night stay or single night stay surcharge $60. Advertised tariff is for 2 adults with extra @ $30 per night per person. Beautiful native bush setting and views of the Coromandel Harbour. Masterbathoom with shower, vanity, toilet and laundry. Downstairs bedroom has a toilet and vanity. We had a great few nights away the cottage was amazing. The view spectacular. Everything went perfectly. Will definitely be going again!! Marvellous batch with wonderful views. I loved this place, built by someone like me (I still have a bit of wood keeping the patio door shut after 40 years in my house!). The property has everything and whoever gave the builder a label-maker for Christmas did the world a service. Brilliant place, would go back tomorrow. This house is large and the patio has a great view. Spent an amazing two nights here, lovely and private. Surrounded by native trees, we sat and watched tuis and wood pigeons fly around just off the deck. If you need somewhere special to escape the world - I’d totally recommend this place. Really clean, with everything you need and only a short drive into coromandel town. Local services, shops, restaurants and cafe located a short drive away in Coromandel Town.